The following ideas and connections are not all of my own making. This post comes from discussion here, on Reddit and on /a/. I’ve added a few thoughts and insights of my own, but this is mostly me putting some broader discussion on plausible theories together into a readable format. 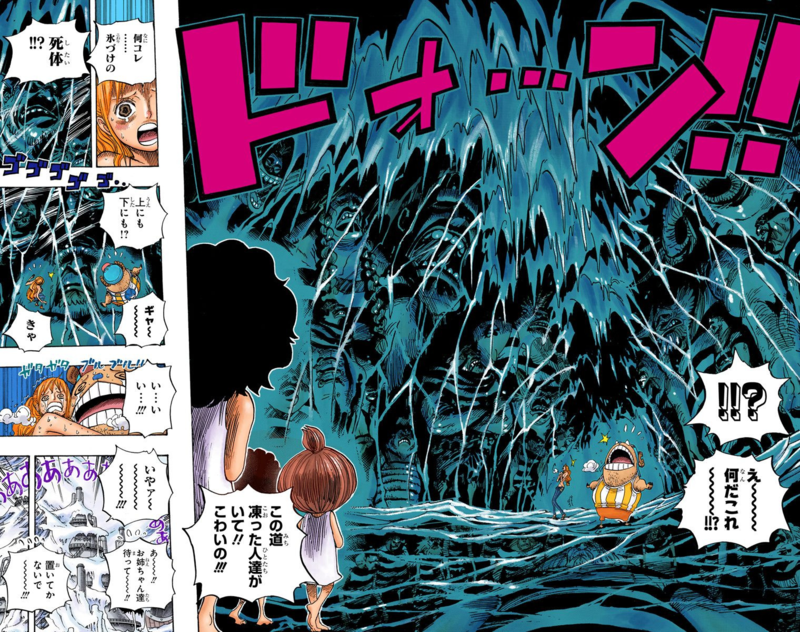 Mainly, we’re looking at the last two pages of chapter 906 and how they connect to other bits of lore and unsolved mysteries in One Piece’s word. Let’s see if I can make this all make sense. Images provided in the spoiler tags under each section, let’s go. Observation: the room under Marie Geoise containing the straw hat has three key features we’re going to use for this set of theories. 1) There are seven openings in the wall. 2) There’s a symbol similar but different to the World Government’s flag carved into the wall above the openings, and 3) It’s cold enough inside that everything has iced over. All of these and the presence of the straw hat are important. Let’s start making connections. That not-quite World Government symbol on the wall looks familiar, and we have seen it before. It was on Oars’ clothes, which we can assume he was wearing at his time of death around five hundred years ago. That means its old. Not Void Century old, but old none the less, possibly a prototype for the current design. And it also means that Oars probably worked with the World Government when he was alive. We’ll be coming back to that. We now know that whatever is in the straw hat room under Marie Geoise is at least five hundred years old, maybe older. Alright, now we know there’s some pretty ancient history in here, let’s tie it to the moon. First we have to assume the straw hat here and Luffy’s straw hat are connected. Not a huge leap, considering their identical designs, save for the size difference, and Luffy’s wanted poster being brought to the Marie Geoise hat. I feel safe in extrapolating that Luffy’s hat has some connection to the Will of D. Shanks isn’t a D. (that we know of) but Gol D. Roger, at this time the oldest known owner of the hat, definitely was. 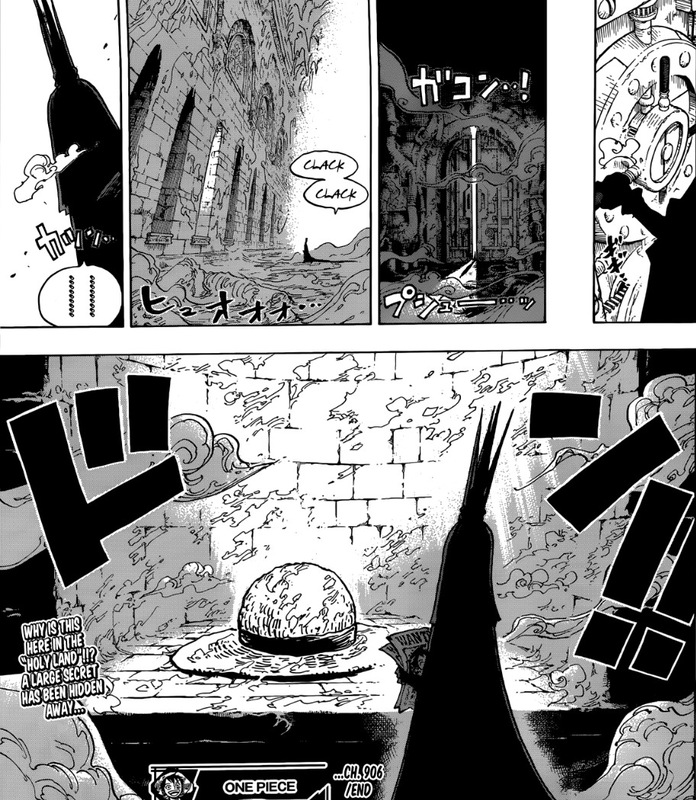 It’s been theorised for some time that the people of the D are connected to the moon, but here’s a quick refresher on that for the uninitiated: Enel found the ruins of an ancient civilisation on the moon in his cover story - wall carvings in these ruins showed humans with angelic wings, similar to the Sky Islanders. It could be the exaggerated proportions of the carvings at work, but the moon people’s wings seem smaller than the Sky Islanders’, indicating the trait could be minimised or bred out completely over time. The theory goes that that people of the D are descendants of the moon people who totally lost their wings, unlike the Sky Islanders, who only had them reduced. What connects the two? A theory that the D. isn’t an initial but a glyph representing a half moon, and the cover of Volume 27, which depicts Luffy with a pair of sky islander angel wings behind him, winking at the reader. It could just be a bit of whimsy for the cover, or it could be some of the most subtle foreshadowing ever. So the Will of D relates to the legacy of the moon people and the small straw hat relates to the Will of D. That is all speculative, so dismiss it if you like, but the pieces do seem to fit together. New factor: the Oharan globe. Now this thing, seemingly depicting One Piece’s earth with six satellites, one of which has a sub-satellite of its own. 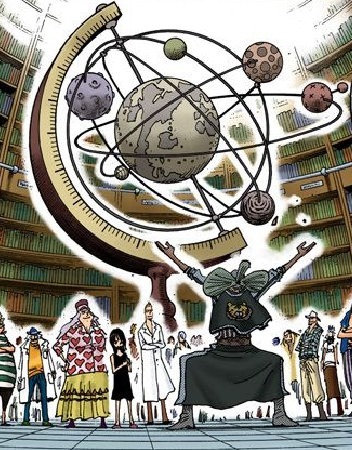 So seven other celestial bodies depicted with One Piece’s earth. I think we can dismiss out of hand the idea that the planet actually has six moons. No image of the night sky has shown more than one, and every mention of the moon is singular only, no plurals. So it’s just a geocentric interpretation of the solar system then? Maybe. But maybe not. One Piece’s world has only one moon. But what if it used to have more? The Oharan scholars are archaeologists before anything else, not astronomers. They deal in ancient history, with a specific affinity for things like the Void Century and other records that have been lost to time. Their infamous globe could represent not how the world is but how it was, based on what they found in their research. Assuming the above is correct, the world of One Piece had seven moons (counting the sub-satellite, since they are a scientifically plausible thing) in ancient times. At least one of these moons was populated. We established before that the Will of D and the small straw hat represent the legacy of the moon kingdom, but what if we instead say they represent the legacy of a moon kingdom instead. Then they and the Sky Islanders can both be descended from moon races - different moon races - without having to get into awkward wing size genetics, and the Volume 27 cover art still works to associate the two as being descended from moon people, just two different races of moon people now. One moon being populated leads to two, and from two it’s not such a leap to say they all were. Seven moon races. Seven openings in the wall in the room under Marie Geoise. The straw hat represents a moon race. There’s a straw hat in one of the wall openings. Ergo, each opening represents a moon and a moon race. EDIT: Theackwardstation suggested another excellent piece of evidence that there were several moons in the past: Duke Dogstorm calls Sulongs the Minks' "true form," which is a little odd for something they only have the opportunity to be once or twice a month. On a world with at least six visible moons, however, it's not hard to believe they could have been able to stay Sulong most if not all of the time, and only then does the "true form" statement really fit. Additionally, given how wild and dangerous they would have been in a near-constant Sulong state, it could explain the reputation the Minks have managed to get for being killing machines despite no one in the present day really knowing them and them being actually pretty friendly in person. To say the World Government destroyed six out of seven moons though, is a bit more of a stretch. We have to extrapolate and guess more for that. The World Government did something bad during the Void Century. We know it has to be pretty shocking, since they’re pretty open about things like genocide and slavery today. Perhaps they destroyed six out of seven moons and genocided the moon races to the best of their ability. Now that’s the kind of enormous-scale atrocity you’d want to keep out of the history books. This is where I feel most likely to be wrong, but it could simply be the tides. Seven moons would play havoc with them and cause all kinds of destructive effects, and if the World Government wanted to tame the seas that would be an obstacle. Or it could even have been just a survival thing. It gets unscientific here, but ‘planet aligning’ events are a common trope, and a seven moon planet could have the same thing happen with aligning moons. Seven moons in a row could have created a tide high enough to create an apocalyptic, biblical flood. In such an event, the only safe places would be Fishman Island, equipped to survive underwater, Marie Geoise, 10,000 meters above sea level, and with the moon civilisations. It’s possible, even, that the Redline was created for the sole purpose of surviving this high tide, employing the help of the Continent Pullers. Wait why’s that a plural? For the sake of this post I’ll be considering Continent Puller a separate classification to giant. Their increased size and distinctive horns (more on those traits later as well) set them apart. It could be a mutation unique to Oars’ line, or it could be a whole separate but extinct species, but they are definitely a different thing to your average giant and deserve to be considered as such. We also know that Oars’ ‘Continent Puller’ title isn’t just empty hype. 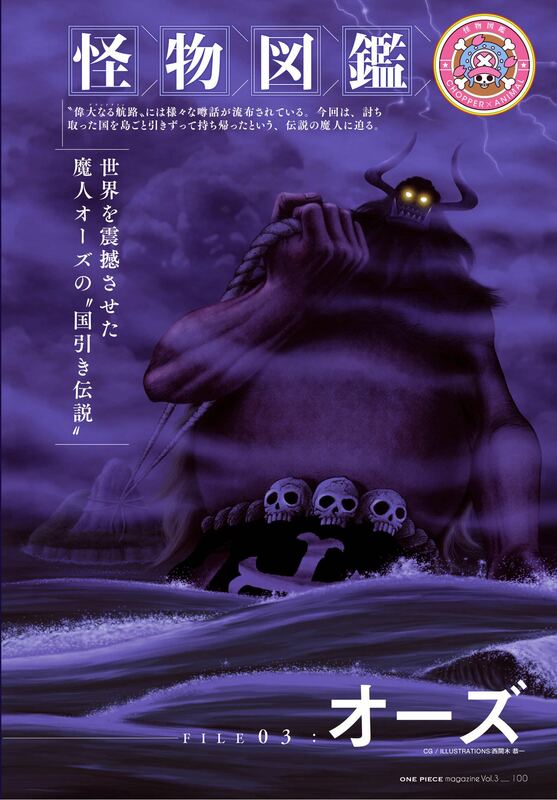 Official art for One Piece Magazine shows Oars in his prime pulling a whole landmass behind him with chains. The epithet seems to be a real indication of strength. So we have a group of super-Giants with strength enough to literally change the face of the planet, we have the corpse of one of these turn up wearing an ancient World Government insignia, and we have a World Government with a very convenient flood-proof holy land atop a 10,000m high pangeaic continent. There pieces all line up, right? This makes sense. As an aside that won’t tie into much else here, interesting that the Ancient Weapon Pluton is a ship. Maybe it was an ark the early World Government used to survive the lunar floods while the Redline was under construction. It fits with the theory that Noah is Pluton, especially considering Noah’s placement, as if it was abandoned and scuttled to sink to Fishman Island when the World Government disembarked from it a final time onto their new holy land. And if the seafaring races that formed the World Government had one ancient weapon, and we know the underwater races of Fishman Island held another in Poseidon, does that mean the moon races must have had Uranus, to keep a balance of power? And to go a little further down that line, symbolically, Poseidon is named for an ocean god and Uranus for one of the skies. Pluton, for a god of the underworld, doesn’t fit as cleanly, but the genocidal nature of the World Government helps it a bit. So the World Government conquered the tides once, working with the Continent Pullers and abandoning their Ancient Weapon in the process. Then they got cocky, got caught up in their taste of godlike power and decided to put a stop to the lunar floods once and for all. It’s hard to say exactly how they did this. Perhaps Uranus was captured and turned on the moon races. Maybe it also goes back to the Continent Pullers. Could something like Fishman Island’s ancient and treasured Energy Steroid have been used to bump their power up from ‘continent pulling’ to ‘planetoid destroying?’ Again, this area of the theory is pretty vague and subject to change as most information comes up. Regardless, the Moon War was fought and won in the Void Century, each of the moon kingdoms’ kings caught and killed, and a space made for each of them under Marie Geoise, each space with a memento of the moon king on top, such as a straw hat. Then all record of the Moon War was erased. The Continent Pullers, however many of them there actually were, were betrayed by the World Government and killed. This may have been just for the cover up, but it could also be because the World Government lost control of them after souping them up to fight the Moon War. Oars is said to have frozen to death, yes, but his body shows signs of numerous serious injuries, and it’s hard to tell what’s bits that just didn’t preserve properly and what happened before he died. Or being stripped of protective gear and left for dead on the Ice Continent was his execution. Either way it’s important that he died there specifically, and we’ll talk about why in a minute. First, let’s talk about the Continent Pullers being made victims of the Void Century, because there are a couple of little symbolic nods in that direction to think of. 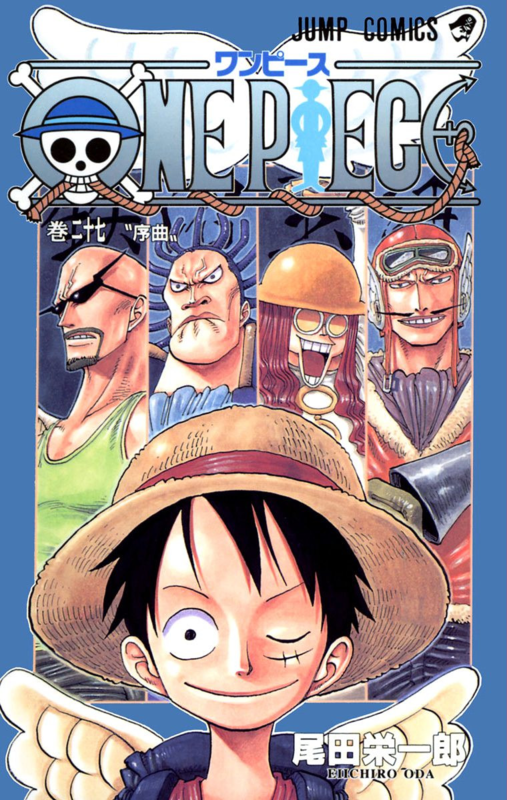 The first was Volume 48’s cover. 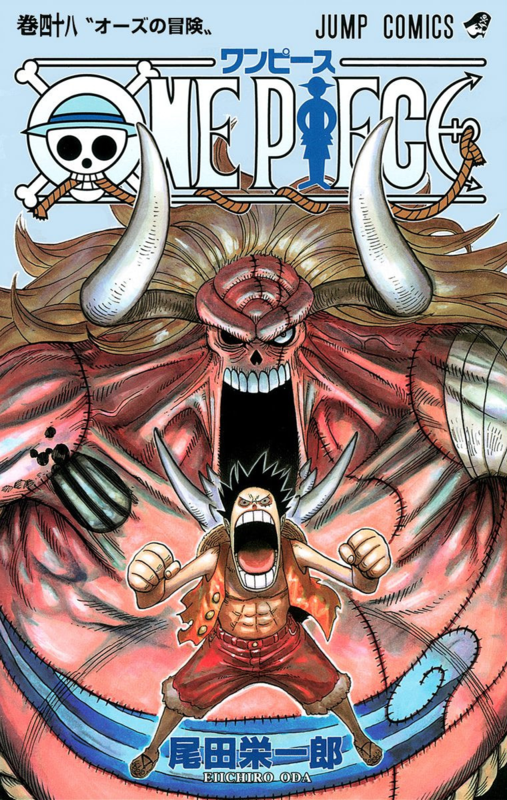 The same way Luffy was framed in front of Sky Islander wings on the Volume 28 cover, Luffy is here framed in front of Oars’ fangs, making it look like he has horns. Not unlike (but also not totally like, to be fair) the distinctive horns the Continent Pullers all have. Similarly, Little Oars Jr, the descendent of the original Oars and our only known living Continent Puller, was made sympathetic through his friendship with Ace. Ace, of course, carries with Will of D and even weaved Oars Jr. a straw hat in the Wano style. Horns on Luffy, a straw hat on Oars Jr. Not exact matches in either case, but similar enough to connect the two. As with the Sky Islanders, an association is being built here. Alright, I wanted to talk about the significance of Oars dying in an icy place, and not just because Thriller Bark couldn’t have happened if he didn’t. And I hadn’t got to why it’s important that the room under Marie Geoise is a freezer yet either. But to talk about that, first we have to talk about Punk Hazard. The World Government was doing giantification experiments on Punk Hazard, among other things. We’ve been told that repeatedly. They want giant soldiers because the strength of Giants is unmatched, and they would probably want to move from there to Continent Puller soldiers, knowing how effective they were in the Moon War. Wanting to go from Giants to Continent Pullers isn’t conjecture either - the warning signs outside Punk Hazard feature a skull with distinct Continent Puller horns on it, and Luffy’s group discovers a skull too large to belong to a giant. We can’t see it in full, but it seems to have a curved horn coming off it as well. Continent Pullers were obviously part of the plan. There were Continent Puller remains on the island. If they worked with and then killed the Continent Pullers it makes sense that the World Government would know how powerful they are and be trying to recapture that power, and where to find remains for genetic material to work with. 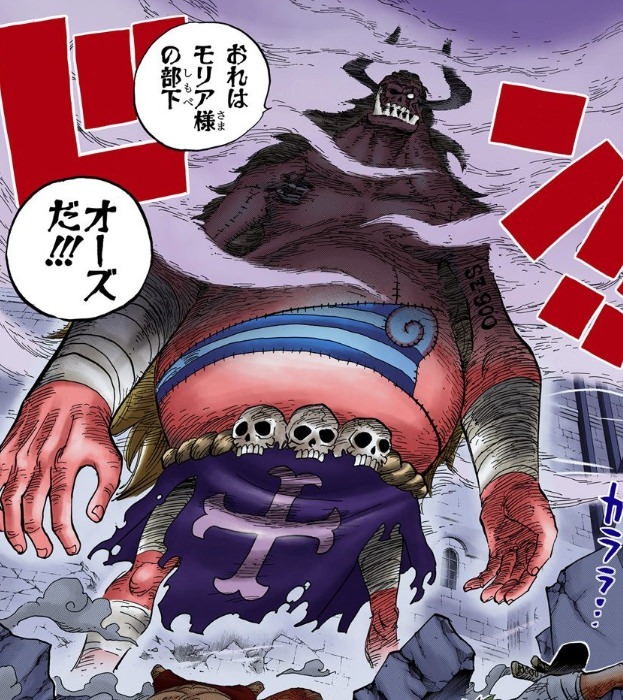 As another aside, Kaido is a Giant sized creature with Continent Puller horns. He’s referred to in ever case as a creature, not a human, and has the kind of nigh-invulnerability you would probably want a soldier to have, and the nihilistic attitude of a man traumatised by an upbringing of horrific genetic experiments. And would it work thematically for a human lab rat to have the affinity for animals that he has? Of course. Kaido could very well be a failed and escaped attempt to genetically engineer new Continent Pullers. Anyway, we see that Punk Hazard has a large cold storage area full up with the corpses of Giants. The World Government is savvy enough to store Giant bloodline elements they find. It makes sense then that Oars was intentionally left to die or killed and then moved to somewhere he would be preserved for later research. And then forgotten about. Or the lab was abandoned after a Punk Hazard style accident until Moria found it. Or Oars escaped the attempt on his life and fled into the icy wastes where he died alone and lost. There’s honestly a few different ways it could have played out. But the bottom line is that the World Government, going back hundreds of years, is savvy enough to store the remains of powerful entities so they can try to genetically recreate them later. So perhaps the room under Marie Geoise isn’t just a symbolic shrine of victory over the moon kings. Maybe each of those openings in the wall doesn’t just have a keepsake from the fallen enemy inside, but the actual corpse of the enemy. The crypt is kept frozen to preserve the bodies for later use. And what later use is that? Well we were actually just told exactly what. Dr Vegapunk’s last two big projects were cyborging Kuma and creating the Pacifistas. The Pacifistas are human corpses combined with cyborg parts to make humanoid weapons. The cyborging of Kuma is interesting largely because Kuma has been made into a mindlessly obedient killing machine, but hasn’t been stripped of his Warlord title. He’s an experiment, to see if such a machine can still bring the intimidation factor the Seven Warlords require to keep their rank. See, the World Government would want something with that fear factor to keep their member states in line and maintain the power balance with the Emperors, but they’d also love something more predictable and easy to control than the privateers they use now. Kuma is a proof of concept for them having their cake and eating it too. He’s the prototype, not for Pacifistas, but for something much worse. That’s all the relevant connecting of dots and theorising I have for you today. Some of the stuff here makes pretty huge leaps of logic and extrapolates hard, and some later bits are theories based on theories, but the rabbit hole of lore fragments that connect to the room under Marie Geoise runs deep, and you’re welcome to draw different conclusions and imagine different possible solutions for the mysteries here. I'm confident in the story elements I've connected here, just not entirely in the way I've connected them. Thank you for reading, and I look forward to being wrong about 90% of everything here. Last edited by Captain M; June 5th, 2018 at 07:02 PM. Great, great theory. I'm mostly iffy on the openings being tombs, themselves, since they don't seem large enough (and I don't just mean the openings themselves, but the area under and above them) to house folks as large as whoever would be needed to wear that hat, especially if they were continent puller size. It seems the hat is closer to the type of thing a Whitebeard or Big Mom sized person would wear, which could tie into the semi-giant sized mystery as well. 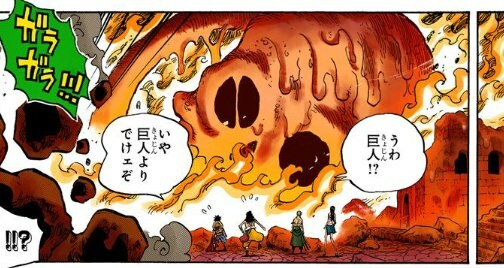 Problem with Noah being Pluton is Robin would have surely known/mentioned this fact because she's read the Alabasta Poneglyph which details the location of it. Also Franky was there, and he has seen the blueprints for Pluton and as such a master shipwright like him would recognize Pluton right away. I may be wrong since I'm saying this from memory, but didn't the Alabasa Poneglyph detail the location of the Pluton blueprints, not the ship itself? You make a strong point about Franky tho, I don't think I can explain that away. You mentioned the symbol on Oars' clothes, the horns which turn up in multiple places and how the latter may relate to Kaido. There's also the fact that Oars' belt has three skulls. As far as I know this only turns up in two other places: on the belt of Little Oars Jr. and on Blackbeard's flag. 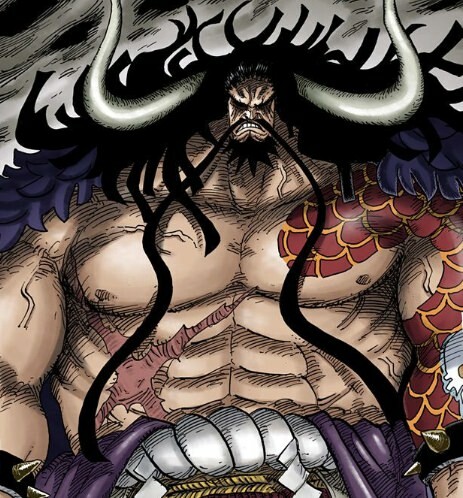 Blackbeard's flag also has the 4 crossbones just like Kaido's. In a roundabout way that links them too and that in turn may relate to the whole thing about Blackbeard having an unusual body. Excellent spot! It's a pretty well established theory that Blackbeard might be a chimera, with the three skulls representing the different parts his body might be made of, hence the ability to have multiple devil fruits, so if we're connecting him, Kaido and World Government genetic research, could chimeraism (chimeraness? chimeraic nature?) be a side effect of one of their experiments? The lore all runs so deep! I can't stop giggling at this picture. Chimerism is an actual word so that one? When I noticed the three skulls thing I also noticed that Blackbeard has a somehwat similar body shape to Oars, but that might very well not be anything important. Anyway, if the three skulls means anything I'd at least expect it to mean that Blackbeard has some link to Oars, be it genetic or otherwise. As for the links to Kaido, I really don't know, I find theorising pretty difficult. Not the thinking up of theories itself but attaching any weight to a single one. it makes my head all whirly. I'd hope and expect to learn something about Kaido's history in Wano and then link it to the flag, and following form that to Blackbeard. Or I'll leave it to you. You seem to have knack for it. Well done, is what I'm saying. Nice catch on the alcove symbol, I'd been wondering it had already appeared anywhere else. Tying the Punk Hazard skull to Continent Puller(s) is very interesting as well, I'd completely forgotten about it. A well developed theory and pleasant read altogether. - In dinosaur extinction theories, a single large asteroid is considered to have had dramatic impacts on Earth. Meteor shower six moons' worth of rock debris on the surface of the One Piece planet and you're looking at not just a large flood, but possibly the total extinction of all life. Even assuming civilization did somehow pull through and prospered again in a mere 800 years, I would expect the land to bear marks in pretty much every region of the world. And by that I mean craters several miles wide - on Earth some of these still exist even after millions of years. Some of the larger debris could even still be orbiting the planet to this day like an asteroid belt visible from the ground. But until proven otherwise we don't see any of that in One Piece. - Until now the ancient weapons were said to be potent enough to destroy islands. They're apparently a relic of the old world, the most powerful and terrific thing to have ever existed, yet some posters consider that even using them to pierce the Redline is too much of a stretch. Now your theory implies that at some point in history, someone as had a planet killer in their hands. How does it fit the picture ? - With how genetics work in One Piece (i.e. however fits Oda's need), it would be acceptable that the D. people and sky islanders share a common ancestry but evolved differently, possibly as a result of advanced science / powers / whatever they had. Some could have retained their wings while others would have lost them altogether. How does this change your theory ? I can still see the descendants of the moon people settling on this world for whatever reason and prospering until they are met with hostility by its original inhabitants. The "moon wars" would have been them vs the moon people, and everything that derives from this still stand. The part which I'd say doesn't hold its ground under these premises is the harnessing of tides. The purpose of the land pullers is still unclear, but I do agree they could have been a tool/servants of the world government at some point in the blank century, and helped reshape the world. The body shape I'm hesitant to take into account to too huge a degree, I think that's just part of Oda's style. Almost every major female character has the same body type, and we don't need tinfoil hat moonwar theories to explain that. But the three skull thing is something that feels like it could be a lot more deliberate and meaningful, but it's hard to say what just yet. Like you said, Kaido's actual backstory should give us a lot more to work with when we get it. And thank you! I don't actually consider myself the best theorist in the world, I'm just trying to connect the dots. 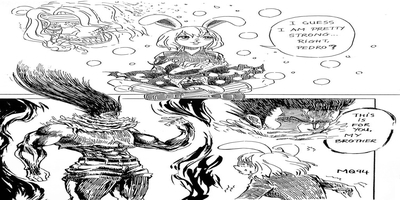 Like I said, I'm pretty sure I'm connecting the right things - there's too many overlapping symbols for this to be a coincidence - but I fully expect Oda to blow my ideas out of the water for the whys and hows of it all. Incidentally, I'm keen to see what Greg thinks about the straw hat room and how it connects to everything. He's been talking up dropping some big ideas on the podcast tomorrow, and after the cake theory I'm willing to bet any money he's closer to the truth than I am! All excellent points, especially on destroying moons. That part is definitely one of my biggest leaps, but I think the Ohara globe is really interesting and I'd love for it to mean something beyond 'geocentric model lol' so I tried hard to work it in. We need a lot more information about the Void Century and the downfall of the moon civilisation we have seen before we can call any theory more than a wild guess, totally. And I agree totally that Oda would have to write damn hard to get around the power scaling nightmare that would be introducing planet buster tech! The first reply and I almost forgot to respond, sorry! That is a good point as well. My best response would be that I don't think the moon people were Continent Puller sized, the ruins Enel saw certainly don't suggest they were any bigger than "normal" One Piece human size. But yeah, it's still pretty tight in those holes. If I really wanted fanwank around the lack of space in the straw hat room for real crypts, I might suggest that the other holes contain actual bodies sitting upright and cross legged, and we just can't see them. Kind of like how you see Buddhist mummies preserved upright in their apparent eternal meditation, but much more sinister. Why's there no one in the straw hat hole? Because the straw hat guy was the first to be taken out of cold storage and Vegapunk'd, that's why. But I feel that's stretching it just a little, so I'm taking the lack of crypt space as a decently reasoned hole in the theory for now. Apologies to meighs if they get pinged a third time by the auto-post merge for this, if I'd realised I had more to reply to sooner I'd definitely have multiquoted! The moon civilisation / sky islanders link is something I'm really curious about. Such as, is the sky islanders' existence known to the world at large other than the occasional winged wanderer (Urouge for example) whom no-one would look at twice in a world teeming with freaks and oddities ? Is the world government aware of their existence ? Are some sky islands affiliated with it ? I seem to remember, all the way back in the Skpiea arc, that someone mentioned there was a safer way to reach the sea of clouds than the knock-up stream. Does this imply there are frequent exchanges between surface dwellers and the sky islanders ? Or are they considered legend, or even altogether ignored, by the majority of the population ? One thing does make me doubt the link of moon people / sky islanders with the D. people, though : based on what we learned in Skypiea, Shandora was originally a surface city. 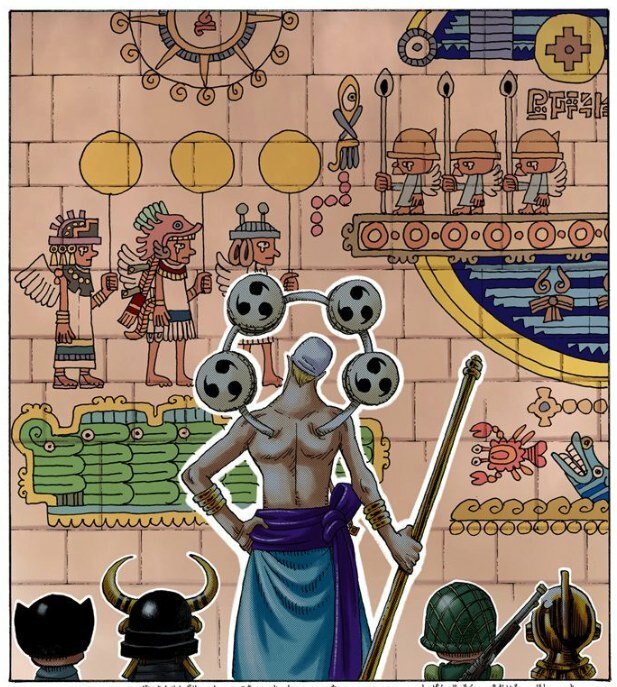 For all we know the same might be true of other parts of the Ancient Kingdom, making the sky islanders a separate people whose ancestors did originally come from the moon (this much is clear after Enel's cover story) but who have minded their own business all along. The Ancient Kingdom / World Government conflict could just as well have been a surface-only thing. Yeah there's a fair bit left unanswered about Sky Islanders, huh? You would suppose they're considered rare, but not unheard of. Rare enough the human auction houses don't even both to list them, similar to Three-Eyes. Or there are just enough weird bodies in the world of One Piece that no one looks twice at the occasional set of wings. Hard to say until Oda gives us more. Was it confirmed that Shandora had anything to do with the Ancient Kingdom, beyond housing a Poneglyph? I don't remember it being said, but my memory is far from perfect and I'm writing this up as I'm about to sign off for the night, so I don't really have time to flip back through the Skypiea volumes and check. Assuming any other part of my theory is even close to correct, I would say the Ancient Kingdom was one of, or an alliance of, the moon kingdoms. Of course it was inferred that it was planetary, but it wasn't outright stated, to my memory. Oh, and if it was the Ancient Kingdom that commissioned the Poneglyphs as a way to preserve their history after their destruction, and the secret to creating Poneglyphs is the sole property of the royal line of Wano, that could mean the people there also have a little lunar heritage, so there's likely to be new info to either encourage or deny this line of thinking there. great theory. the connection to oars and the symbol inside the vault is superb. there is only 100 years of history missing, but some historic events or facts before the void century should still be known. This theory is a little wild for me to go onboard... but there's something I'd like to mention regarding the hypothesis that the other moons were destroyed in the past... the minks. It's interesting how Inuarashi mentions Sulong as their true form, which is strange considering it's a transformation that happens only during nights with a full moon. However, maybe in the past the minks were in their Sulong forms all the time because the moons together could provide the same effect, so they were reduced to this "lesser" form after the incident. That was a nice read. Good eye on that connection to Oars symbol. But I was never sold on the multiple moons, I think those are planets. If I was to add a point of view I'd say I think the giant freezers under MG might not be storing corpses. Dofla knows that it's possible to become immortal with the Ope Ope fruit, so maybe what's/who's under MG is alive and that's a jail. The extreme cold would stop them from moving and becoming free. 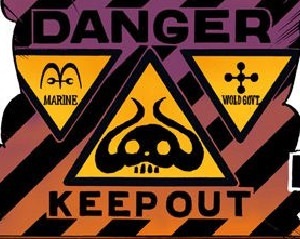 Just had a thought, and forgive me if this was already mentioned, but about that seven moons thing and the cross symbol on Oars’ loincloth being similar to the WG flag with the five orbs...what if it is meant to represent 7 orbs but the 2D perspective just obscured the two in the front and back? And the symbolism was just lost to history? There may be more to it but that number 7 just got the gears turning. Was it confirmed that Shandora had anything to do with the Ancient Kingdom, beyond housing a Poneglyph? I skimmed through the relevant volumes, here's what I got. - In 272, Robin finds a wall of poneglyphs carved inside a ruined house. She states that the Poneglyph of the great bell were brought to Shandora - not created there - and that the city faced an enemy and falled protecting it. - In 290 (Norland flashback), Calgara states again that the city falled trying to protect the Poneglyph. - Shandora's fall would have occurred right after the Void Century (Montblanc's lifetime : 400 years before present day / fall of Shandora : 400 years before Norland's arrival to Jaya). I don't think it was ever stated explicitly, but I guess this means Shandora was an affiliate/ally of the Ancient Kingdom - or maybe a part of it, but remote enough that it wasn't wiped out immediately - that survived through the Void Century long enough to take part in the Poneglyph effort, similar to the Kozuki clan of Wano. This does raise a few questions. - If Shandorah fell (presumably at the hands of the soon-to-become-World Government), then why the hell did its poneglyph remain untouched ? Indestructible they might be, but whoever went through the pain of destroying a city to remove it from public knowledge could certainly have taken an extra step and bury the Poneglyph, or take it away, or send an expedition later to finish the job. - How come the World Governement hasn't been hoarding Poneglyphs over the past 8 centuries? If they're so afraid of what these artefacts may one day reveal, you'd think they would collect as many as possible, lock them in a crypt deep below Pangea castle - instead of some oversized hat - and throw away the key. Or are the Poneglyphs hidden so well and in places so dangerous that it's just easier to go after anyone foolish enough to research them? - Shandorah falling some 800 years ago implies that their enemies could and did reach Jaya at that time. What happened during and after the Void Century that could have made it an unbelievable legend some 400 years later, and Jaya a place only bold navigators like Norland could reach? Is this part of the World Government's effort to hide their tracks, going as far as to erase any documents - maps, books, ... - that would mention the island? Or does it have to do with Grand Line making travels so hellishly difficult that even the World Government didn't bother sending anyone afterwards? This got me thinking. As you say, "only" 100 years are unaccounted for. If so, someone like Robin, who is well-versed in history, should be able to deduce, or at least make theories on, who and where the Ancient Kingdom could possibly have been based on the geopolitical map of the world such as it was before and after the Void Century. Which nations joined the World Government, which ones went missing, you don't even need a poneglyph. The archeologists of O'hara probably did exactly that to help further their research. And indeed, if the Void Century had seen changes as dramatic as destroying moons or moving continents around, surely that wouldn't have gone unnoticed either. I feel it's the sort of event that's too big to be just shoved underneath the carpet of history. Last edited by Seafarer33; June 4th, 2018 at 01:41 PM. I feel confident at this point that the "StrawHat" treasure found in Mariejois and the StrawHat worn by Luffy and Roger have the exact same powers. I think that the StrawHat in Mariejois used to belong to Joy Boy. And I feel like both this hat and the current StrawHat worn by Luffy grant the user the ability to "Hear the Voice of All Things". Right now my only evidence for this theory is the knowledge that Joy Boy, Roger, and Luffy seem to all have this ability to "Hear the Voice of All Things". However, I feel confident that I'm correct here. Its the reverse. Its the location of the ship. It would be impossible for the poneglyph to point to the blueprints because its transportable. Franky destroyed the blueprints but Pluton still exists somewhere in the world.